Aric Almirola and the No. 10 Smithfield Ford Fusion team for Stewart-Haas Racing (SHR) head to Texas Motor Speedway in Fort Worth for the 34th Monster Energy NASCAR Cup Series race this season. The event also marks the second race in the Round of 8 in the 2018 Cup Series playoffs. Almirola is coming off of an 11th-place finish Sunday at Martinsville (Va.) Speedway. The entire four-car SHR contingent remains in the hunt for the winner-take-all Championship 4 season finale Nov. 18 at Homestead-Miami Speedway with only this weekend’s event at Texas and next weekend’s race at ISM Raceway near Phoenix left to try and qualify. The two-time championship-winning SHR organization, which makes up 50 percent of the remaining playoff field, is the first since Joe Gibbs Racing in 2016 to have all of its entries reach victory lane. Almirola currently ranks eighth in the playoff standings with 4,033 points, 25 behind the final cutoff spot for the Championship 4. A win this weekend or next would automatically lock him into the Championship 4. The 34-year-old Almirola’s trip to Texas earlier this season resulted in an accident just past the halfway point in the race. Before this year’s spring race, Almirola had completed all of his previous starts at Texas. Almirola has one Cup Series top-10 there with an average starting position of 19.9 and an average finishing position of 20.6 in 15 starts. Almirola and his No. 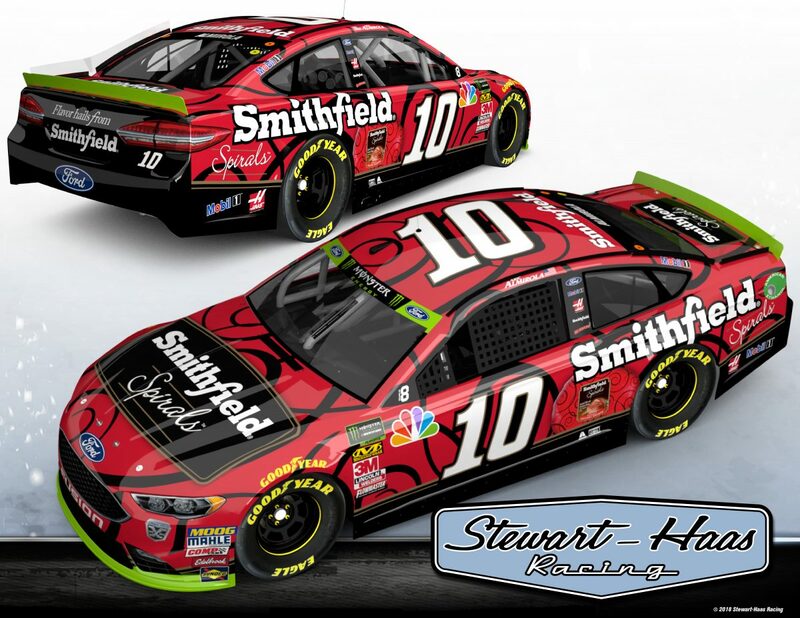 10 Ford Fusion team are hoping a special paint scheme featuring Smithfield’s Spiral Sliced Ham product will bring good luck this weekend. With the holiday season just around the corner, Smithfield is promoting its perfectly cooked, spiral sliced ham as an ideal addition to most every kind of holiday feast to make family and friends feel special, and by making holiday cooking a breeze, as well as providing equally flavorful leftover dishes. Fans can visit Smithfield.com/HolidayHub, for information on how to make every holiday soiree a breeze, as well as foolproof tips and simple recipes that are sure to wow holiday guests with flavor-filled dishes for all the celebrations the season brings. Almirola and his team are also hoping their recent success at tracks like the 1.5-mile Texas oval – the bread and butter of the Cup Series schedule – will continue to yield positive results this weekend. In his last 10 starts at 1.5 mile tracks, Almirola has five top-10 finishes and has led 70 laps with an average starting position of 12.2 and an average finish of 14.4. On Oct. 14, the Tampa native piloted a special bacon-themed Smithfield Ford Fusion to victory lane at Talladega (Ala.) Superspeedway. The unique paint scheme coincided with Smithfield’s Bacon for Life promotion. Yes, it’s possible to win bacon for life. The sweepstakes runs until Dec. 31, and fans can enter by finding specially marked packages of Smithfield bacon in stores, then visiting Smithfield.com/BaconForLife and entering the unique code provided in the package. More than 1,000 runners-up will be awarded select bacon merchandise. Texas is the 31st points-paying event during which the Smithfield livery has adorned Almirola’s No. 10 Ford Fusion. Smithfield, a brand of Smithfield Foods, which is based approximately five hours northeast of SHR headquarters in Smithfield, Virginia, is in its seventh season with Almirola and its first with SHR. Founded in 1936, Smithfield is a leading provider of high-quality pork products, with a vast product portfolio including smoked meats, hams, bacon, sausage, ribs, and a wide variety of fresh pork cuts. Through 33 races this season, Almirola has amassed one win with an average start of 16.0 and an average finish of 13.3 with three top-five finishes and 14 top-10s. He’s also led 181 laps this season, already a career best with four races remaining. Do you think we’ll see some different strategies employed by the playoff teams in these final rounds, even if they’re at the end of a stage? SHR has four teams in this Round of 8. What is an advantage, and what is a disadvantage with that scenario?